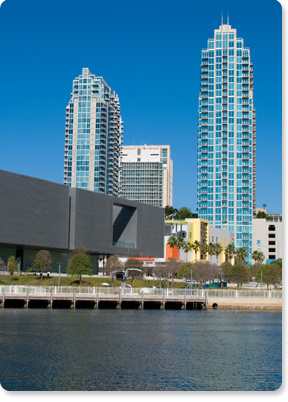 Tampa is a city bustling with attractions that draw visitors from all over the world. 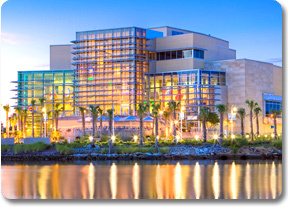 On its waterfront, the Tampa Convention Center hosts a variety of conventions, trade shows and special events. The county's visitor and convention bureau, Visit Tampa Bay maintains a Visitor Information Center here. The cultural arts district of downtown Tampa is an emerging neighborhood that is home to a diverse community of cultural organizations including The David A. Straz Jr. Center for the Performing Arts and Patel Conservatory, the largest performing arts center in the South. The Tampa Bay History Center complements Tampa's Riverwalk, an area that will serve as a key location of many community-wide events. In addition, the Tampa Museum of Art will anchor this growing cultural arts district. Downtown Tampa is also beginning to evolve into an urban center. Currently, some 88,000 residents call the downtown area home, and many are moving into the downtown core itself. More and more people are choosing not only to work downtown, but to live there as well. Downtown Tampa currently has eight Major Hotels, with more than 2,000 hotel rooms for business and leisure travelers. HART's downtown Trolley connect visitors and residents with all that Downtown Tampa offers. In addition to established restaurants like Jackson's Bistro located on Harbor Island, Cafe Waterside, Champions and Il Terrazzo at the Tampa Marriott are continuing to serve Downtown Tampa's growing crowd. The Channel District is home to the Port of Tampa, Florida's largest seaport. Many major cruise lines and commercial freighters, as well as pleasure craft and sailboats call this harbor home. Annually, around 900,000 cruise ship passengers embark to their favorite Caribbean or Mexican destination via the Port of Tampa. Downtown Tampa enjoys the nostalgic charm of the streetcar with the TECO Line Streetcar System. The streetcars connect Downtown and Channelside to the Port of Tampa and Historic Ybor City, and are replicas of the original Birney Safety Cars that shuttled passengers around Tampa beginning in 1892. With 200,000 square-feet of air-conditioned fun, The Florida Aquarium anchors the eastern side of the Channel District. It's a world-class facility with hundreds of entertaining and educational exhibits. Endorsed by the American Zoological Association (AZA), it's the must-see attraction for all ages. Ybor City in Tampa Florida delights visitors with architecture from a bygone era, including wrought iron balconies, globe streetlights and brick-lined walkways. In this historic setting, culture and entertainment opportunities with a Latin flair abound. For complete information about everything to see and do, make the Ybor City Chamber of Commerce your first stop. Just down the street is the Ybor Museum State Park, which covers approximately one-half of a city block and includes an ornamental garden, a gift shop and restored cigar workers' houses. In the heart of Ybor City, you can't miss Centro Ybor - the appropriately named shopping, dining and entertainment centerpiece. Give yourself enough time, because there are theaters, dozens of restaurants and shops, and fun, fun, fun.Tampa Bay Brewing Co is the only Brew Pub in Ybor City. They offer great food & a wide variety of handcrafted beers. Browse the eclectic shops along 7th Ave like Revolve Clothing Exchange and Silver Edge Jewelry direct importers of hand crafted jewelry. Take the time to watch a "hand-rolled cigar" being made. Ybor is known as the "Cigar Capital of the World" and for purveyors such as Tampa Sweethearts Cigars where every cigar is manufactured by Tabacalera A. Fuente, a name well recognized all over the world by cigar aficionados for its fine quality and prestigious reputation. Tampa's Latin Quarter knows how to heat things up. The entertainment district, with more than 60 restaurants, bars, and nightclubs, draws up to 30,000 people on weekend nights. Favorite eateries along the strip include the Spaghetti Warehouse, Carmine's Restaurant, Bernini, Acropolis and Gaspar's Grotto. If you're just looking to wet your whistle, search no further than the Coyote Ugly or The Green Iguana. No need to drive. 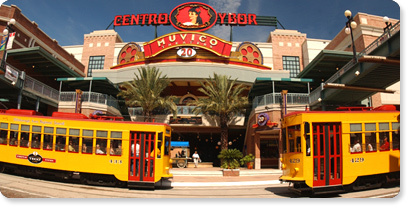 Just hop on the TECO Line Streetcar at one of their four stops in Ybor City, Tampa! Come see all the art and history of Downtown Tampa.